Product prices and availability are accurate as of 2019-04-13 21:41:59 UTC and are subject to change. Any price and availability information displayed on http://www.amazon.com/ at the time of purchase will apply to the purchase of this product. A newborn will be content lying on her back, gazing into Mommy or Daddy’s face. And that doesn’t really get old for a long time. But baby’s brain and muscles and skills are developing, and after a while she would like a wee bit more entertainment, if you don’t mind. The award-winning Gymini Super Deluxe by Tiny Love is a classic, sure to provide, well, minutes, but they add up to hours, of amusement! And parents know that even 10 minutes of uninterrupted time to make dinner or throw a load in the wash can be a blessing, even aside from the myriad benefits the Gymini play mat gives their little one. And what are those benefits, you ask? The list goes on and on, but here’s a start. The Gymini folds out into a 32- by 32-inch soft mat, virtually swarming with colorful illustrations of jungle flora and fauna, most notably a giraffe, zebra, lion, and elephant. 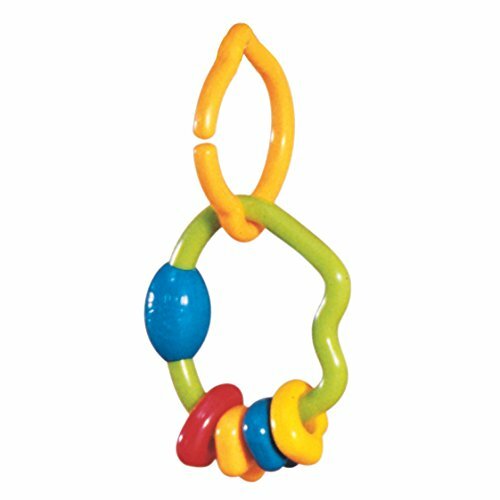 Overhead two padded arches cross, from which dangle more critters, as well as a large mirror and a plastic bead rattle. Hidden below, baby will eventually discover, is a music box that plays Mozart and several nursery tunes. 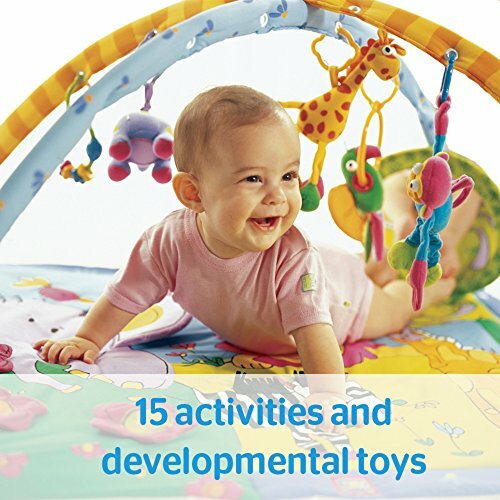 Textures, colors, sounds, and lights abound, and baby has the power to make all these objects squeak and jingle and jitter and flash, as soon as she can figure out how to make those hands and feet and mouth of hers connect with her heart’s desire. Herein lies the developmental potential. Whether she’s waving her limbs around; aiming specifically for the goggle-eyed, smiling monkey overhead; or rolling over to find the source of that I.Q.-enhancing classical music, baby will be hard-pressed not to advance her infant skill set on the Gymini Super Deluxe. 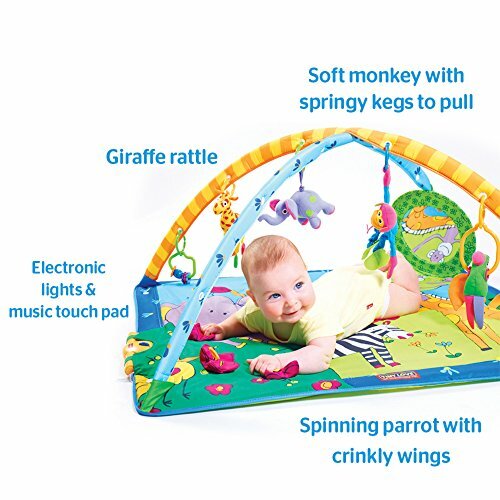 From the monkey with springy leg to pull to the vibrating, jitterbugging elephant to the mirror she can see if she just lifts that heavy head a bit higher…everything on the play mat has a mission: to make baby learn. Cause and effect is a biggie: when she bats at the giraffe, it rattles. When she pokes one corner of the mat, music and lights seem to emerge from the fabric flowers. When she rubs the elephant ear on the mat, it makes a fun crinkly sound. Those large muscles are getting a real workout, too, resulting in improved large motor skills: reaching, kicking, rolling over, pushing up. Many babies don’t particularly enjoy their necessary daily "tummy time," but the Gymini encourages baby to lift and turn her head to see the mirror and find the flashing lights. Tummy time is fun again! And don’t forget the fine motor skills! Those little fingers have to meet if baby wants to grasp the zebra’s mane or the parrot’s crackling wings. 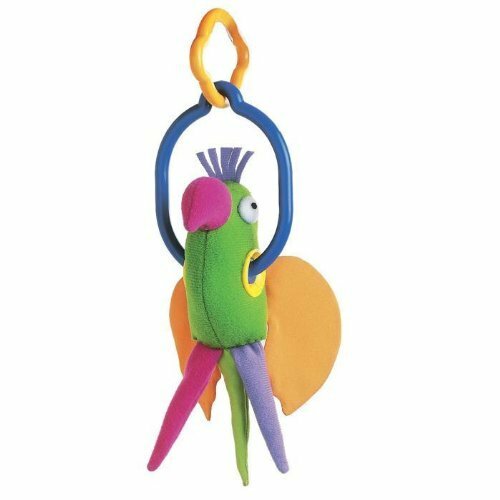 Plastic rings hang from the many holes in each arch; dangling from each is a plush animal or toy, providing still more stimulation. 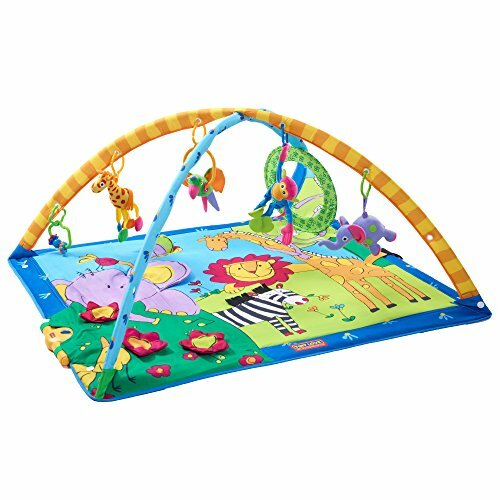 Additionally, parents can easily switch out the toys for variety, simply detaching the included toys from the rings and looping other baby-safe toys on. A hidden music box in one corner of the mat includes an on/off switch with two musical selections: 10 minutes of Mozart or three short fragments of popular nursery tunes. The music is a bit plinky, as is the norm with most baby toy music, but not at all offensive. When the music stops, all baby needs to do is press anywhere on that corner of the mat to start it up again—she is further encouraged to do so by the flowers that light up when the music plays. 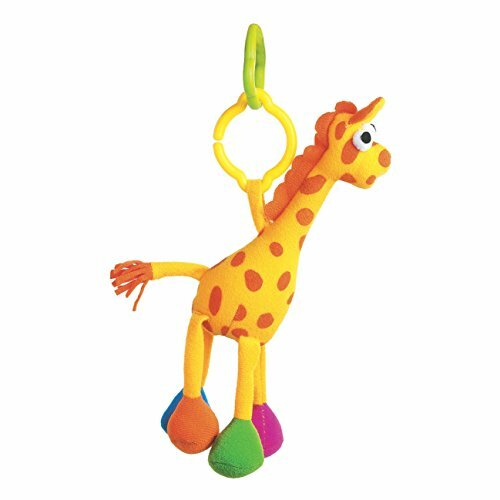 A hidden squeaker in one of the birds, peek-a-boo with the elephant ear, flap-flap-flap with the butterfly wing, tug-of-war with the giraffe’s tail…the play potential is limitless, whether she’s sitting up or lying down, one week old or 8 months old.